I would love to say I am getting back to dipping my toes in the water of writing, but let's be honest. These days I feel a little more like I am barely keeping my head above water so let's not even talk about my toes. Although...they do look pretty since I finally got a pedicure after a billion months. No more Indian girl toes here (you can ask if you want...). Why not start there? From "let's not go barefoot" to "warm & fozzie OPI"
I got my first pedicure and haircut in months last week. Self care is more about zoning out these days than actually receiving care, but it was nice to feel a little fresher after trimming up the 'do and painting up the toes. Sure, the toes are covered in socks and boots, and the hair is most likely in a ponytail, but it's the principle, right? Last we met, I was filling you in on Medicare battles and mom's recovery and all that jazz. Thankfully, we did win our appeal reconsideration thanks to the help of a friend who is an attorney specializing in such things, so the last week of mom's stay at the sub-acute rehab center was covered with our standard copay (which is a pretty penny anyway). However, given the stress and agitation over the ability for her insurance to simply decide she is done with rehab and resuming the fight, we decided to move her into a private pay memory-care assisted living center for the moment while they had a spot open for her. It is surreal. In three months, she has gone from living completely independently to living in her own little fantasy where loads of people from the past are coming to see her everyday. I know there is always room for a miracle, but it seems like I just have to adjust to this being our new normal. Jojo is growing fine. He and I spend lots of quality time together avoiding being smothered by his affectionate siblings. They love talking to him, kissing my belly, and hugging my belly with python strength. I, on the other hand, have only gained 3 pounds this whole pregnancy. I am starting my third trimester. While everyone assures me there is nothing to worry about, and my belly is definitely growing as the school principal pointed out last night (but I'm cute, so we're ok), it still sounds very strange to hear that after having gained MUCH more the last two pregnancies. Also, if I somehow end up not losing weight at the end of all of this, I am definitely going to start picketing the new math which will have conspired against me. Our house is up for sale. We had put a contingent offer on another house, but that fell through. At the end of the day, we are thankful for that as more reflection led us to question whether it was right for our family. Keeping a house "show ready" with a cat, two littles, and a third protruding from my belly is no joke. I'm not gonna lie. I have not kept up this week, so with a showing tomorrow we have a little tidying and cleaning to do. Also no lie - this is the cleanest this house has ever been and we are now ready for company . . . except that I'm kind of exhausted. During this radio silence on the blog, I have been tremendously blessed to be part of a new pop-up shop on Instagram called Zelie & Co. Truth be told, I'm not sure how I got lumped in with these lovely crafters and artists, but I know God's hand was all over it. They have helped breathe life into my spirit at a time when I am sorely tempted to give up the struggle of creating anything - words, art - anything. Did I mention I am exhausted? We are holding our first charity auction next Tuesday (yup, get out yo fat wallets for Fat Tuesday and get to givin'!) 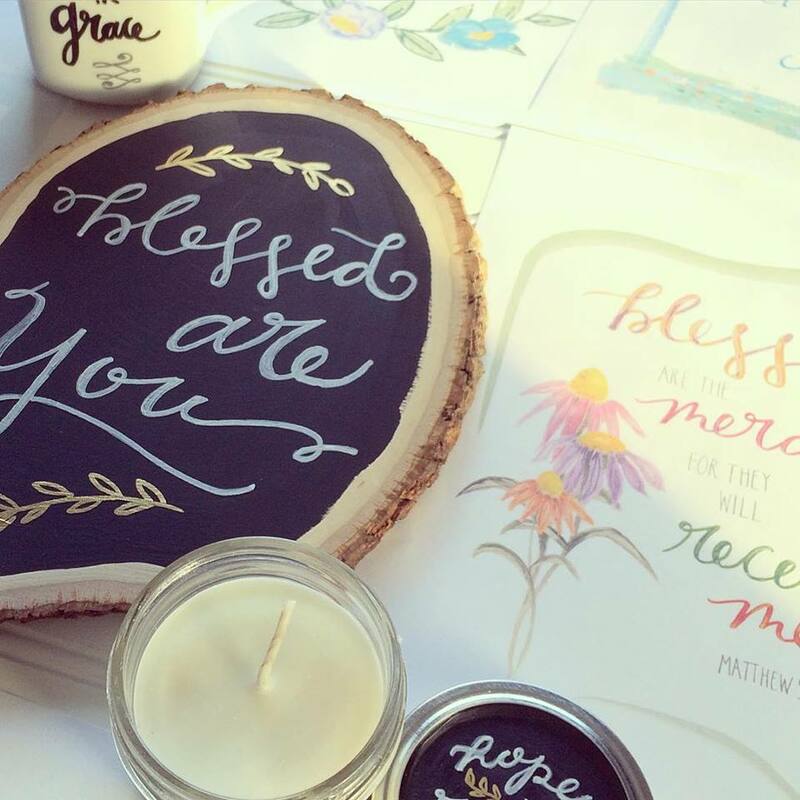 where the artisans are teamed up with bloggers to raise money for Catholic organizations. My lovely partner, Mary of Passionate Perseverance, and I are raising money for Mary's Mantle - the Catholic maternity home where I work in metro Detroit. If you are on Instagram, follow us and stop on by! I was all set to put the Etsy shop on vacation (because exhausted, remember? ), but then that charity auction came around so instead, I've launched a new line of prints and jewelry. Why not? The shop may still take a wee vacay, but it won't be for a little while now. Lent. Y'all. It is NEXT WEEK! Usually, I am all planned out with what I am giving up and what I am reading, and all that jazz. This year? Whoa. It's NEXT WEEK! Ash Wednesday is the Hubs' birthday, too. That is a lot to think about! So, hit me up with your Lenten goals!! What's a gal to do who is barely keeping her head above water? My first thought is a phone fast during certain parts of the day to be more present to what I am called to do. You know, St. Gianna's whole "make holy the present moment," bit. I would love to say I am going to read, but with my mind grasping big thoughts like a sieve holds water, I think that will be a bit much this year. My goal is to be more constant with taking time to sit in silence, maybe with some music, and reflect on my devotional I started in January with not much constancy. The kids . . . well, we will have to wing it a little bit I think. I may resurrect the paper chain from years past with ways for them to Fast, Pray, & Give . . . and learn a little about the saints. OR . . . maybe reality will set in and my biggest goal will be to lose my ish a lot less on a normal day. Maybe. That be it from these parts for now! I'd love you to keep us in your prayers as we are still facing some huge decisions and transitions in the next few months. 1) I need a pedicure and I am so glad you got one. 2) My prayers are always with you. 3) I never gain more than 10 lbs with any pregnancy. I am fortunate though to put on 15 per kid in the postpartum period. I think my body is so sick of being sick that I am starving after the kids exit. 4) I don't know if I will ever be brave enough to move out of our home because I am SO scared of having to keep my house show-ready. Wow, you have a lot on your plate right now! Good for you in squeezing in a tiny bit of self-care, sounds like you really need it. Prayers for your mom, your house sale, your sweet baby, and YOU!